It seems that every time we watch the news or read the paper, we learn about some new tragedy. Death occurs with astonishing regularity, even if the circumstances surrounding it become more and more bizarre. How Can We Respond When Faced With Death? II Corinthians 5:8: We are confident, I say, and would prefer to be away from the body and at home with the Lord. Philippians 1:23: I am torn between the two: I desire to depart and be with Christ, which is better by far. 18 This is GOOD NEWS: we haven’t missed it! 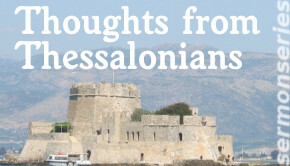 The Thessalonians were concerned because they’d received differing accounts of Jesus’ return. Paul writes to them to set them straight… and we can be reassured as well: Jesus WILL return, and He WILL take us home: that’s all we need to know, and that’s what gives us hope! How Do We Test For Intent? 1 Th. 2:8 because we love, we want to give more than the gospel, but our selves. Give your SELF away! eBay has a new verification service to prevent fraudulent goods being sold: they’re shipped to experts who verify authenticity before the buyer gets them. How Can We Tell If Thankfulness Is Genuine? => Don’t let the fact that you’re being watched cause you to be self-conscious. Rather, recognize that God’s work in you is WORTH WATCHING. The Thessalonians were faithful, but not too mature in their faith. Paul shares this encouraging thought with them to remind them that God IS among them, doing His work. Our takeaway: we don’t NEED to have Master’s degrees to be used by the Master! There’s a wonderful song that’s a favorite of mine: People Get Ready by Margaret Becker. The concept in the song is that Christ could be coming back at any time, and we’ve got to be ready to go. What do you need to do to get ready to leave on vacation? Now how would that be different if you knew you were going to be leaving for good? The Thessalonians were getting some pretty mixed up advice about how to prepare for the coming of the Lord. Paul sets them straight, and encourages them to be sober minded as they think about what they need to be doing in their lives. This is great advice for me as well – to be sober minded as I think about what I need to get done. I have no idea how long I’ll be on the planet – so while I’m here, I want to be like Jesus, and be about “my Father’s business”. Lord, make me aware of not only what I need to do, but who I’ll be working with, and for WHOM I am working (I’m serving You, not just the ideals that You laid out). Amen. When I became a follower of Jesus, I was taught that God was going to “vanish” all of the people of God at any given moment… and that if you weren’t ready to go, you’d be left behind. This was a teaching that was originally designed to give hope, but because it was based in fear, it ended up causing more anxiety than hope. Paul was dealing with people who were being told wrong things about the final Ressurection in Thessolonika as well. To give them hope, he spelled out the “final countdown” of how God would rescue all of the people of the Kingdom. It’s very simple, and doesn’t have a lot of date-specific details. MUCH more hopeful. I need to remember that God WILL rescue all of us who are part of the Kingdom – and to do whatever I can to encourage as many as possible to be a part of that Kingdom as well. But GOD is the one who does the rescue; I’m just doing my small part, and staying hopeful. Closing Prayer: Lord God, come quickly. But if you choose to wait, please use me to expand your Kingdom while I’m waiting for You. Amen. 1 Finally, brothers and sisters, we ask and urge you in the Lord Jesus that, as you learned from us how you ought to live and to please God (as, in fact, you are doing), you should do so more and more. 2 For you know what instructions we gave you through the Lord Jesus. 3 For this is the will of God, your sanctification: that you abstain from fornication; 4 that each one of you know how to control your own body in holiness and honor, 5 not with lustful passion, like the Gentiles who do not know God; 6 that no one wrong or exploit a brother or sister in this matter, because the Lord is an avenger in all these things, just as we have already told you beforehand and solemnly warned you. 7 For God did not call us to impurity but in holiness. 8 Therefore whoever rejects this rejects not human authority but God, who also gives his Holy Spirit to you. Have you ever been so anxious to be involved in something you just can’t wait? As a child, I used to love going swimming at American Lake… I just couldn’t wait to get into that cool water, and I’d just jump in at the first opportunity. What is the bible author saying to you in this verse? – 1 paragraph: I’m drawn to the word “abstain” in verse 3. Paul is telling the Thessalonians that they are to abstain from intimacy outside of marriage. I looked the word up, and the word can be translated “hold back”. The idea is that while the draw – the lure – of extramarital closeness is understandable, we need to hold back. There are lots of things in my life that function as lures to me; things that do their best to draw my attention away from Christ, away from my relationships with my family. I’ve found a great freedom in recognizing those lures (“oh, yeah, I sense that temptation”) but then reminding myself that I’m dead to that draw. Lord, help me to “abstain”, to back away from those things which do their best to draw me in to places or situations that I shouldn’t be in. Be a zombie – the living dead!